1959 Simplicity #2872 vintage sewing pattern, misses' slenderette two-piece suit, size 12. Jacket has a notched collar, set-in sleeves, flaps and braid trim. V1 features a slim skirt with waistline darts and a back kick pleat. 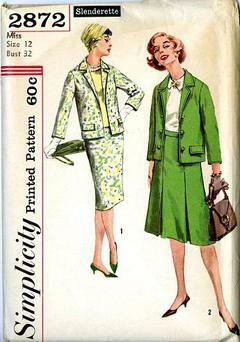 Jacket and skirt are of same fabric. V2 features a 6 gore skirt which has inverted pleats at lower edge of side front and side back seams.